While some programs had special effects, the products that caused excitement in 1989 “fused the interactivity of the computer with the power of video.” Advancements in the way video images were stored and accessed fueled the possibilities. Laserdiscs could store stills and clips in analog format. DV-I technology to compress and store video images digitally was only a few years away. The prediction was: “in the next few years, we will see products that can easily fuse video images and computer graphics on the same screen.” Imagine! There were about 100 educational videodiscs available in 1985, 400 in 1988, and over 1800 by 1991. Early titles included Interactive NOVA: Animal Pathfinders, ABC News/Optical Data’s In the Holy Land, and Lucasfilm/National Geographic’s GTV: This Land Is Our Land. Texas was the first state to approve using textbook funds to purchase videodiscs. They bought Optical Data’s Windows on Science. Apple’s HyperCard had a great influence on creating interactive multimedia. Originally produced in 1987, it was included with all new Macs and had huge instruction manuals. It was revolutionary for its interactivity, object-oriented authoring, and creativity. As director of School of the Future in New York in 1990, I gave out sets of manuals to any student who wanted to learn how to use HyperCard and teach the rest of us. A group of students met me at the school door each morning, eager to try what they read about the night before. They programmed slide shows, animations, and stacks of cards with information, and they created alternate paths to read them. Other programs adopted the HyperCard concept. Easy-to-use HyperStudio became a favorite and by 1991, HyperStudio 2.1 was one of T&L’s top five programs of the year. Computer simulations were popular too. Teachers had used role-playing exercises for years and technology improved the method. Teams of students could learn about a situation, debate what to do, make a decision, and see how the results worked out. Sometimes they had to make other decisions to undo the unintended consequences. Even old favorites like Oregon Trail, which replicated traveling the wagon trail route of early settlers, and Where in the World Is Carmen Sandiego?, which taught geography and reference skills, looked a lot better with new capabilities. Tom Snyder Productions developed the Decisions Decisions series that put students into problem-solving situations. They read up on their characters and the history involved and then debated what to do. In Immigration, for example, School of the Future students learned about poor immigrants who had no homes, no food, and no resources. They sympathized and voted to let them come into their community. Then they had to figure out what to do when the immigrants applied for their jobs. These thought-provoking programs enriched learning in countless ways. Productivity tools were the other essential for classrooms as software took on greater sophistication. Word processing was the mainstay of language arts classrooms and productivity packages became popular. AppleWorks and Microsoft Works included not only a word processor but also spreadsheet, presentation, and communications software. PageMaker heralded a new era of desktop publishing, and research emerged from the library with electronic encyclopedias and atlases. In the summer 1995 issue, T&L issued a list of groundbreaking software for its 15th anniversary issue. How many do you remember? Two years later, in September 1997, the cover story was “The Web Goes Multimedia” (more about the Web in a future column). It didn’t yet have a simple point-and-click interface. For the most part, new software was released on CD-ROM. It wasn’t until the turn of the century that enough schools were wired for online learning. 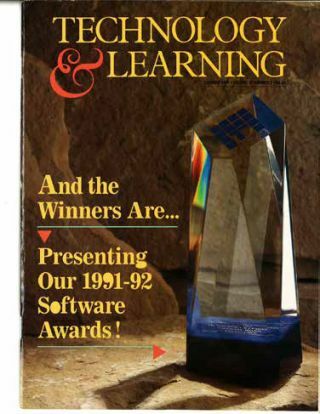 Throughout the 1990s, T&L’s software awards were mostly for stand-alone products. In 2000, T&L reviewers recommended information pathfinding, classroom projects, and teaching with primary sources—all online. By 2005, T&L celebrated its 25th anniversary, a “World without Wires,” podcasting, and learning management systems. In December 2008, T&L’s Awards of Excellence included the stand-alone products Adobe Visual Communicator 3, Achiever! Formative Assessment, and Faronics Insight. Award-winning online software included Flypaper, ExploreLearning Gizmos, and MoneyU. By 2011, T&L asked “What’s the Big Idea?” and looked at solutions for open source, assistive tech, social networks, and more. Today it’s all about apps and cloud. That happened fast, didn’t it? Gwen Solomon was senior analyst at the US Dept. of Education, director of The Well Connected Educator, and is the author of several books on edtech, including Web 2.0: How-to for Educators. She has been a contributing editor for Tech & Learning since 1998.